Although Los Angeles is a popular destination for tourists of all ages, teenagers especially will find the City of Angels full of exciting activities, adventures, and events. Whether your teen is a bookworm, an outdoor adventurer, or a shopaholic, there's something for everyone in this southern California city. From visiting one of the many theme and amusement parks in the Los Angeles area to going horseback riding in the mountains just outside the city, you're sure to find something to add to your itinerary. Plus, even if you live in LA, you might find a few ideas you haven't yet done with your teenager, or if you are a teen, some things to add to your LA staycation list. While Six Flags Magic Mountain is considered the "coming of age" theme park in L.A. for its more extreme coasters, it depends on your teen for whether or not you want to go here. A lot of L.A. teens prefer Knotts Berry Farm's more intimate footprint with a diversity of options for the more and less thrill-seeking types. It's a favorite way to celebrate high school graduation, so it's not just younger teens who appreciate the park's charms. If your teen is still a Disney fan, Disneyland, and especially Disney's California Adventure, are always fun for teens, but remember to plan in some time for the night-time dance parties. However, if there's only time or money to visit one theme park while you're in L.A., Universal Studios Hollywood might be the top choice. The rides are more virtual than real, but you get the combination of rides associated with movies and TV shows they know and the Tram Tour that takes you through the working back lot of the TV and movie studio. Unless you live at the beach somewhere else in the country, most people make a beeline for the beach when visiting Los Angles, and if you are traveling with teens, you can't beat Venice Beach. While there are ocean and sand along all 75 miles of Los Angeles beaches, the Venice Beach Boardwalk has a scene you won't find anywhere else. The boardwalk is active all year long, especially on weekends, but it's most crowded in summer. Permanent souvenir shops, head shops, and snack bars line the inland side of the boardwalk, while table vendors, artists, and street performers are set up along the sand. Although the faces of the artists and performers vary, there is a good chance you'll see some of the exact performers you've seen in the background in popular movies and TV shows. At the south end of the strip are the famous Muscle Beach outdoor gym and the concrete skateboard park on the beach. If that's not enough activity to keep your attention, the people-watching is highly entertaining, too, or you can rent bikes and take a tour of the entire stretch of coastline if you're so inclined. If your teen is the active, adventurous type, a surf lesson is a great way to immerse him or her (and you) in Southern California's beach culture. Knowing how to swim is a prerequisite, and Strong legs and good balance help, but even if you never stand up, learning to surf is a lot of fun. It's better to take a lesson rather than just rent a board and try to learn on your own, partially for the coaching, but also to make sure you don't run into territorial issues. The surf instructors in Santa Monica, for instance, know where to take you, so you're not tripping up the professionals. Another popular water sport is stand-up paddle-boarding (SUP), which is done on calmer water, like the canals in Marina del Rey and Long Beach. It looks effortless when you see people doing it, but it takes every muscle in your body, including some you've probably never used before. Check out SUP with Wade or Pro SUP Shop in Marina del Rey for lessons. Kayaking is another fun way to get out on the water. You can kayak the ocean waves, but for beginners, the inland canals offer a flat-water option. Popular places to rent kayaks include Marina del Rey, Long Beach, Huntington Harbor, and Newport Beach. If your teen is 16 or older, attending a TV show taping can be a fun way to introduce him or her to the exciting world of showbiz that's made Hollywood famous. Be aware; it usually involves a lot of waiting around, so weigh how much time you have available to devote to this before you plan it. If your teen has a favorite sitcom, it's worth seeing if it's taping, but even seeing the filming of an unknown pilot during the summer hiatus can be an enjoyable and educational experience for both of you. The Jimmy Kimmel Live! show tapes right in Hollywood across from the Chinese Theatre, so if you're visiting that area, it can be a good one to see, and it tapes more often than sitcoms since it's a daily show. There are usually actors and contemporary bands as guests, and there is a separate outdoor performance stage behind the studio where you can see the band perform a more extended set. If you don't have 5 or 6 hours to spend seeing a TV show being taped, a one or two-hour studio tour is another way to get a behind the scenes look at the TV and movie industry—you might even catch a glimpse of a famous actor or two working on the lot! If you go to Universal Studios, their tram tour of the back lot is included, or their VIP tour lets you walk around on set. Warner Bros, Paramount, and Sony also offer stand-alone tours. If you come from a cattle ranch in Wyoming, horseback riding may not be high on your list of things to do in L.A. But for beginning riders, and anyone who wants to see a different side of the city, a guided trail ride is a fun way to see the local mountains and the city from higher elevations. Some trail rides start right in Hollywood and go up behind the Hollywood Sign while others explore the mountains above Malibu, including the Paramount Ranch, or the Palos Verde Peninsula. A walking trail ride can be a bit of a letdown for experienced riders, but some outfitters let you book a private ride where you can pick up the pace. Take Your Teens Hiking in L.A.
Another great way to see a different side of Los Angeles with your outdoors enthusiast teenager it to take a hike through the local canyons and mountains. With trails that start in Hollywood, like Runyon Canyon, or trails in Griffith Park to the Hollywood Sign or the Griffith Observatory, a day of hiking is a convenient and great way to get out of the city quickly. If you have a bit more time, though, you can drive a little farther into the mountains to find trails that are less crowded and offer even more stunning views of the Valley. Be sure to take sunscreen, water, snacks and your cell phone with the GPS tracking enabled in case you get lost. You'll probably want to turn off your cell phone or set it to airplane mode until and unless you need it, since there is no signal in a lot of the canyon and mountain areas, and searching for a signal will run down your battery. If you have allergies or asthma, pay attention to the respiratory and allergy air quality reports before heading out. Although less impressive than its San Francisco, New York, and Boston counterparts, Chinatown in Los Angeles is a great place to take your teenager, especially if they've never visited China but are interested in its culture and people. One of the most important annual celebrations on the lunisolar Chinese calendar is Chinese New Years Day, which falls on February 16 and starts the "Year of the Earth Dog" in 2018. Chinatown comes alive on this day with a parade and festival celebrating Chinese culture. The center of Chinatown is located primarily along Broadway and Hill Street, north of Cesar Chavez Avenue in Downtown Los Angeles. Other downtown Los Angeles attractions nearby include Union Station and El Pueblo de Los Angeles at Olvera Street, the Music Center, Grand Park and the LA Civic Center, and L.A. Live Sports and Entertainment Complex. One of the most famous skateboard parks in LA is the one at Venice Beach, but there are many others. Skateboarding is even more native to many Southern Californians than surfing, with a much more accessible price point and opportunities to skate all over town. If you didn't grow up on a skateboard, lessons are available, but it's also fun to hang out and watch the tricks. In addition to Venice Beach, other easily-accessible parks include the Cove Skatepark in Santa Monica and Stoner Skate Plaza just a bit further toward downtown as well as Hermosa Skate Beach in Redondo Park, William Nickerson Gardens Skate Park in Lynwood, and the Michael K. Green Skate Park in Long Beach. Most of these facilities allow you to rent gear from them, but if you have your own rollerskates or boards, feel free to bring those in and save some money. Most teens are into music to some extent, and L.A. has abundant opportunities to see bands and DJs perform. The Hollywood Bowl and the Greek Theatre in LA, and Pacific Amphitheatre and Irvine Meadows Amphitheatre in Orange County are fun outdoor venues for big-name concerts. For indoor shows in LA, you can take your teen the Staples Center, the Microsoft Theatre, the Forum, the Honda Center and many smaller venues, too. To see what's coming up during your visit at any of those venues, check out Ticketmaster. There are also many combination restaurants and bars like House of Blues in Anaheim that host local and touring bands and have many events that are not limited to 21 and over. Some clubs and concert venues like the Echoplex or Avalon also host events that are also for 16 or 18-year-olds, but you should check the age limit on each performance before buying tickets. Los Angeles is home to over 200 museums, so even if your teen isn't remotely interested in most exhibits, you can probably find one to spark his or her interest, if you know where to look. Many teen visitors and residents recommend going to the Griffith Observatory, a great place for seeing stars; the California Science Center, with lots of opportunities for hands-on experimenting including riding a bike on a high wire; the Natural History Museum; and the LA County Museum of Art. If those sound too academic for your teenager, you could go for the Hollywood Museum or Paley Center for TV costumes and props, Ripley's Believe it or Not, or the Guinness World Records Museum for trivia or take your Goth teen to the Museum of Death, one of LA's most unusual museums. There are also museums for fans of cars, planes, ships,​ and trains. Regarding price, Los Angeles shopping isn't really any more expensive than shopping at home for most tourists, so don't let that misconception deter you from knocking out some school shopping with your teenager while spending the day enjoying each other's company. One of the most popular shopping destinations for teenagers is The Grove, which offers a variety of shops ranging from accessible to exclusive, perfect for a day of shopping with your teenager (or a quick trip to grab something you didn't pack!). There's also a trolley car that runs along a track to the neighboring LA Farmer's Market, both of which are popular spots for celebrity sighting! 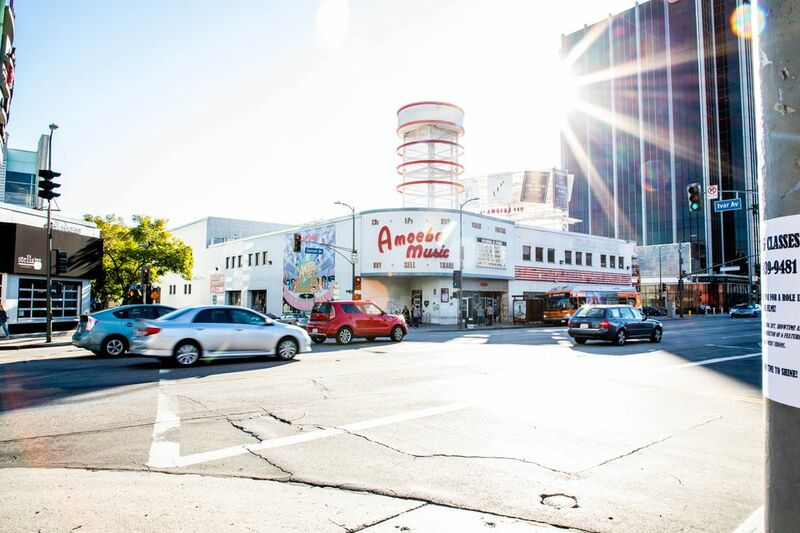 The "Vacation Gals" recommend the Beverly Center as a cool place to shop or just browse, and another teen-favored retail stretch with an entirely different vibe is Melrose Avenue through Hollywood. If your teen is into a period look, there are cool vintage shops on Melrose and in other parts of LA. Racked LA published "A Guide to Vintage Shopping in LA," which includes some of the best thrift shops for finding throwback threads. You can also see a bunch of vintage clothes and furnishings in one spot on Retro Row on 4th Street in Long Beach, or at the monthly Rose Bowl Flea Market on the 2nd Sunday of the month, or the Long Beach Antiques and Collectibles Market on the 3rd Sunday of the month. For the true shopaholic, fashion-forward teen, the 1,000 shops of the Fashion District offer trend-leading duds for dudes and dudettes as well as hundreds of options for finding that perfect prom dress. Los Angeles residents, for the most part, are quite proud of their professional sports teams and venues, and celebrities aren't the only ones who take their teens to LA sporting events. You might not have such prime seats in your budget, but depending on where in the season Los Angeles teams are, you can usually find affordable seats to see the Dodgers or the Angels play baseball, the Lakers or the Clippers play basketball, the Kings play hockey, or the Galaxy play soccer. For something a little more out of the ordinary, you can take in a roller derby game with the LA Derby Dolls or other local leagues. Although Los Angeles is packed full of amusement parks, there are many other thrills to experience in this massive city—from simulated sky-diving to standing above the city on a glass floor. It's not an all-day activity, but if you're in the vicinity of Universal Studios, a stop at iFly Hollywood on Universal CityWalk could give you and your teen a thrill. It's a chance to float on air as if you're skydiving in a big Plexiglas tube, which is a real blast at any age. OUE Skyspace LA is another great opportunity for some safe thrills for you and your teenager to enjoy. Located on the top floor of the US Bank Tower, this open-air observation deck features a glass "skyslide" and 360 views of Los Angeles. Teens can have fun practicing their driving skills out of traffic at any of the many indoor and outdoor kart racing facilities in Los Angeles, and there are options available for drivers ranging in age from toddlers to adults (Go Kart World in Carson accepts as young as three years old). Indoor kart racing uses electric vehicles with up to 10 karts per race and can be a great way to entertain teenagers, especially those who aren't yet able to drive legally. Just keep in mind that height requirements for most "adult" rides are 46 inches or taller, so avoid this if your teenager hasn't yet hit his or her growth spurt. Lil' Indy, K1 Speed, CalSpeed Karting Center, SpeedZone Los Angeles, and Two Wild Karting are all great places to go if your teenager has the need for speed. Foodies and hungry, growing teenagers alike will enjoy eating—or at least going for dessert—at Bottega Louie in Downtown Los Angeles. This fancy-casual marble-floored Italian restaurant, Italian and French bakery and gourmet market has been on all kinds of lists for best restaurant, best pizza, best brunch, best atmosphere, and best restaurant with free Wi-Fi in local publications, so it's no wonder it's a popular spot for foodies of all ages. The dessert displays and rainbow macarons are a work of art, and it's fun to sit where you can watch the staff at work in the open kitchen. You don't have to spend a fortune here, but you'll want to. Santa Monica Pier, home of Pacific Park amusement park, is another popular destination for younger teens—but also offers the older crowd a few great options. Take in a movie-scene-style view of the city from atop the Ferris wheel at Pacific Park or let your younger teenager ride one of the classic amusement park rides on the pier. The food's not that healthy and not that cheap, but if you and your teenagers are in the mood for some typical fair-style fast food, this is a great place to grab lunch. If your teenager is a little older, you should also check out the 3rd Street Promenade in Santa Monica, because many musicians and celebrities just getting their start hang out in this hip neighborhood. There are also several interesting and unique locally-owned shops here, which is another great opportunity to shop for some one-of-a-kind (yet still affordable) clothes for school. Los Angeles isn't just the City of Angeles; it's also a city of celebrities who work in Hollywood (and the surrounding California mountains while on location) filming blockbuster movies year after year. If your teenagers are celebrity-obsessed, consider taking them on a quest for a celebrity sighting, but remember to be polite and respectful—celebrities are people, too. One of the best ways to catch a glimpse of a celebrity—other than hitting up celebrity hotspots mentioned earlier in this list—is to buy a ticket on a tour bus of the celebrities' favorite Los Angeles neighborhoods. Take two hours (or half the day) and embark on a Hollywood celebrity homes tour (typically $39), which features a narrated 12-person bus ride through the celebrity mansions in the Holywood Hills and a stop at the Hollywood Bowl, where you can take pictures of the Hollywood sign. Alternatively, you could visit the famous Hollywood Walk of Fame, where celebrities who have "made it" in Hollywood (and in general in pop culture) are awarded stars on the sidewalk to commemorate their success. Be sure to snap a few pictures of your teens standing on the Hollywood stars of their favorite celebrities! For teenagers who love animals, especially exotic and aquatic ones, there are two all-star destinations you can go in Los Angeles: the Los Angeles Zoo and the Aquarium of the Pacific. The Los Angeles Zoo is located near Griffith Park and its 133-acres houses over 250 species ranging from giraffes to the rare mountain tapir. Founded in 1966, the Zoo has been a staple of Los Angeles for years and undergone many significant renovations due to a spat of animal escapes in the 1990s and 2000s. Located in Rainbow Harbor in Long Beach, the Aquarium of the Pacific features the famous "Blue Cavern" exhibit, a giant glass wall that's been the background of many romantic movie scenes throughout the years. If your teenage child is into marine biology and aquatic life, he or she might enjoy the optional "behind-the-scenes" tour, which guides visitors through what it takes to operate and conserve the marine life held in captivity.